TELL US A LITTLE ABOUT YOUR OWN INDUSTRY BACKGROUND AND WHAT BROUGHT YOU TO FASHION? I was always creative and studied sculpture in my hometown New Zealand. My practice blended art with fashion, so I often worked on exciting installations and projects. One of these was a Vivienne Westwood show where I worked as a backstage dresser. I remember holding these incredible, architectural boots and knowing that I’d found a way of blending sculpture, fashion, and working with my hands. I moved to Melbourne soon after to learn how to make shoes. I was awarded the Ian Potter Cultural Trust to study my Masters Degree in Fashion Footwear at Cordwainers, London College of Fashion. After returning from London, I designed for a selection of top Australian retailers including Country Road and Gorman, until I decided to go my own way and create a brand that supported my own values and vision. HOW DID NELSON MADE COME TO BE? WHAT IS YOUR VISION FOR THE BRAND? I’d been working as a footwear designer for some years and was becoming increasingly uncomfortable with the over production and over consumption that is rife in the fashion industry. I missed making shoes by hand and started to think about how I could do what I love and create a model that is kinder to the planet. I worked backwards from that end point. How to make shoes locally, by hand, with minimal waste and still have enough time to enjoy myself with my husband and dog? The answer was sandals. Customisable sandals. Designed to be modular so they fit together easily and could be assembled in my Melbourne studio. My personal values are fundamental to the business. I believe that you should treat the world and all those in it with empathy, kindness and respect. My business mirrors that philosophy. WHAT DOES ‘SUSTAINABILITY’ MEAN TO YOU, AND HOW DOES IT FACTOR INTO YOUR BUSINESS PRACTICE? To me sustainability is just that. Living sustainably within your means. For our business it means making only what’s been ordered, or small batches of stock that turn over quickly. We value quality, not quantity. We take our time and make product that our customers love, that we are proud of and that lasts. We endeavour to do everything we can to source sustainable material options and we use up-cycled and vintage fabrics. We produce 80% or our range (our flat sandals) locally – keeping our carbon footprint low. TELL US ABOUT YOUR DESIGN AND MANUFACTURING PROCESS? The design is easy. I’m constantly inspired by the women in my life and how they dress, so I simply design stuff I think they would love to wear. 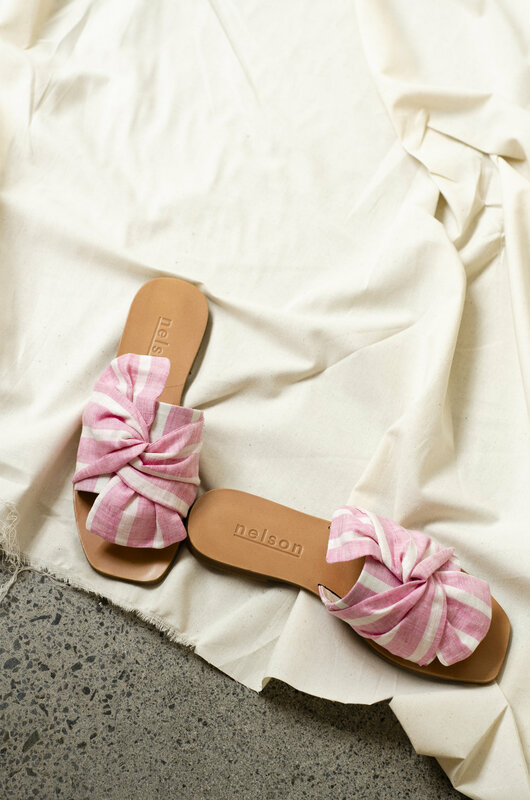 I make the flat sandals here in our Melbourne studio and we work very closely with our ethically accredited sample room in China who make our heeled sandals. We would love to make all of our product in Australia, but at this point we don’t have the machinery to make the heels in our studio. AND WHAT STEPS HAVE YOU TAKEN IN YOUR SUPPLY CHAIN TO ENSURE ETHICAL PRACTICE? Our sample room in China (where our heeled sandals are made) is audited every 3 months by a third party auditor that checks for working conditions + fair pay. There’s a bit of a debate as to the sustainability of leather, but equally so to some of the vegan alternatives. Navigating materials can be a tricky space, with there being pros and cons to most, what materials do you work with and why? You are very right to point out that the vegan alternatives are often as bad as the leather counter part – this is something we’ve thought about a lot. We source vegetable tanned (not chromium tanned) leathers were we can for our leather product. When we offer vegan alternatives we use locally (eco) printed organic linen, rather than the plastic alternatives to leather that are so often used in vegan wares. We are currently researching non-plastic vegan alternatives to leather, but these materials are still quite difficult to acquire as a small business as the minimum order quantities are often quite large. This is a long-term work in progress for us. textile WASTE is a huge issue in the fashion & textile sector, what are some ways that Nelson Made are tackling this? We offer free repairs and a free sizing + alteration service for the lifetime of our sandals to encourage thriftiness! We use CAD technology and a mix of laser and cutting machines to nest pattern pieces in the most efficient way on skins, minimising waste as much as possible. 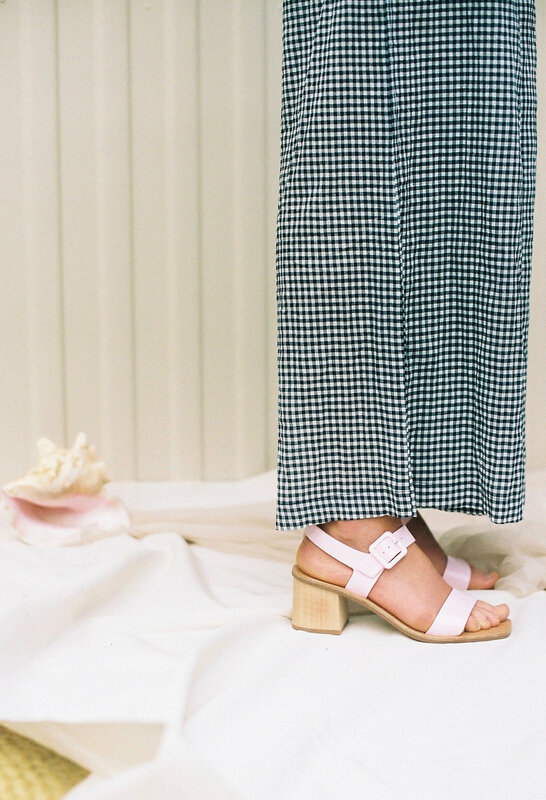 Lately we’ve worked on some super-exciting projects with designers Arnsdorf and Penny Sage to utilise their production off-cuts to make our sandals. These collabs have been an absolute winner with our customers and so invigorating. I never thought I’d get so excited by the term circularity! We often use recycled vintage fabrics in our collections – they add depth and texture to the range and are so different to other fabrics on the market. I also love that there is a limit to how many pairs can be made with up-cycled materials – it makes each piece more special. How have you found the process of making locally and what have been some of the biggest challenges/opportunities here? We have a great balance in our business between local and off shore production. Our flat sandals (around 80% of our range) are made in Melbourne and the remainder are made in China. We have a very strong relationship with our manufacturing partners who support us in our capacity to make in Melbourne. This takes some of the pressure off producing locally as we can rely on our partners for machinery, technical support and materials sourcing. This then allows us to focus on making efficiently here and keeping our cost accessible. We have a vision for the future of using technology to bring all of our production back to Australia, but this is going to take us time to achieve. How do you go about communicating your sustainability journey to your customer? Have you found that this is something they are asking for? This is an incredibly exciting time to be in business. I’m an optimist regarding the climate challenges ahead and believe that innovators and entrepreneurs alike can fix this mess we’ve got ourselves into. We are now at a point where the market is pushing for business to offer sustainable solutions + products and that is truly exciting. We talk about our stand on sustainability with our customers on every platform we can, and they love it. One of the most rewarding parts of starting this label has been finding our community and realising that there is a demand for product that is created with the values that matter to us. Internationally Stella McCartney is the most impressive. McCartney is a pioneer in circularity, materials innovation and animal welfare. A great example of what a large company with backing can do when they put their mind to it. Closer to home, two Melbourne brands currently impressing me are Arnsdorf and A.BCH. Both brands offer a model of radical transparency. There is a lot of green-washing at present, but these guys are the real deal. It takes such dedication to be completely transparent as a small business and I believe these two are the best at doing this right now. WHAT’S NEXT FOR NELSON MADE? We are very excited to launch our latest collaboration with New Zealand brand Penny Sage. We’ve worked with the PS team to collect production off-cuts of their most loved past season fabrics to create some incredible slides. We are so proud of this project that has given new life to fabric that would otherwise be disposed of.